Nine prominent liberal religious thinkers examine Darwin's contributions to theology, spirituality and ethics. The editor,Fredric Muir, is a Unitarian Universalist minister and the author of several works on liberal religion, including A Reason for Hope: Liberation Theology Confronts a Liberal Faith and Heretics' Faith: A Vocabulary for Religious Liberals. Find discussion questions based on The Whole World Kin on our Skinner House Companion Resources page. Two hundred years after Darwin's birth, the time has arrived to complete the revolution he started, by understanding that other living creatures are members of our moral community—sensitive social beings like ourselves—as well as our biological kin. While linking hands with our own parents and progeny we must also reach across the species barrier to join hands in sympathy with the animals who are our partners in everything that matters most. New research shows that monkeys even possess a sense of fairness. Train two female capuchins to perform a similar task, but reward the first with a bland slice of cucumber and the second with a tasty grape. When she sees the inequity, the first monkey will refuse to cooperate with the game, which offends her idea of right and wrong. How, then, do we justify the notion of human supremacy, or the claim that the fruits of justice belong exclusively to the sons and daughters of Adam and Eve? "These nine essays demonstrate that those who see a conflict between religion and science, between Charles Darwin's vision of the world and that embraced by many deeply religious individuals are simply not looking very clearly. 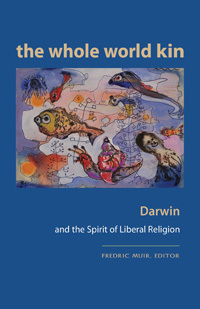 As Fredric Muir so eloquently says in the introduction, 'the spirit of liberal religion is enhanced and deepened by Darwin's life and thought.' Savor these essays and come to a fuller understanding of both religion and science." "This volume illuminates the spiritual as well as intellectual achievement implicit in Darwin's great paradigm shift. By tracing our essential connections to all living creatures, the entire natural world, and the most basic stuff of the universe, these essays offer a grounded self-understanding for human beings that is both radiant with wonder and appropriately humble in our finitude. All varieties of humanists, as well as liberal religionists in general, will find inspiration here." —Dr. Kendyl Gibbons, senior minister, First Unitarian Society of Minneapolis, co-dean, Humanist Institute. "Darwin gave us a new a new lens through which to view the universe itself - an enlarged sense of history and destiny. These essays challenge us to engage his legacy from a religious perspective. This volume is a plea for a faith rooted in our best knowledge of the universe and our position in it."